Actual patient of Dr. Devgan, before and 1 month after breast augmentation. Nearly 300,000 American women pursue that goal each year by undergoing breast augmentation (breast implant surgery, or breast enlargement). Breast augmentation is the most popular cosmetic surgical procedure in America. Most women who are considering the procedure are seeking the very best-- the most beautiful, natural, and feminine results that are achievable for their body, build, and frame. In New York City, where my practice is based, women typically want breast implants that are natural looking, beautifully contoured, and comfortable. They want a fast recovery and a subtle result. In my practice, many women also seek me out because they prefer a female plastic surgeon who will be discreet about this sensitive topic. During our initial meeting, I will examine, measure, and photograph your breasts. We will discuss your medical history and your desires for surgery. I will show you samples of silicone and saline breast implants so you can feel the difference between them, and choose the type you prefer. You will have an opportunity to "try on" different sizes of implants to figure out what is right for you. Finally, we will look at many before and after photographs, so you can get a sense of what a typical result looks like in someone with your body type. Surgery typically takes one hour, and it can be performed either in my fully accredited private office operating room, or at one of the top local hospitals on the Upper East Side. After you wake up, you will relax a bit and then be able to go home. In the first 24-48 hours, you will have a small amount of swelling, bruising, and discomfort. Many patients need to take pain medicine during this time period. Most patients spend the first 1-2 days resting, reading, watching tv, and going for short walks. After 48 hours, you will be able to shower normally. If you have a desk job that does not require strenuous activity, you will likely be able to return to work by the 3rd or 4th day after surgery. At this point, most women switch to only taking Tylenol for pain. Many of my patients who have surgery on Friday are able to return to work by Monday or Tuesday, depending on the type of jobs they have. If you want to give yourself a bit of extra pampering, I suggest taking a week off. By one month after surgery, the vast majority of patients say they feel "back to normal." Bruising, discomfort, and most swelling has disappeared. The breasts will still continue to "settle" into their final position over the course of the next few months, and a tiny bit of additional swelling will go away, but one month is when most women really feel normal again. By 6-8 weeks, you will be cleared to do all types of physical activity again. Some exceptions may apply for elite athletes who put extremely high demands on their chest muscles. And of course, each person is different, so this timeline should be interpreted as a general guideline, rather than an unalterable rule. 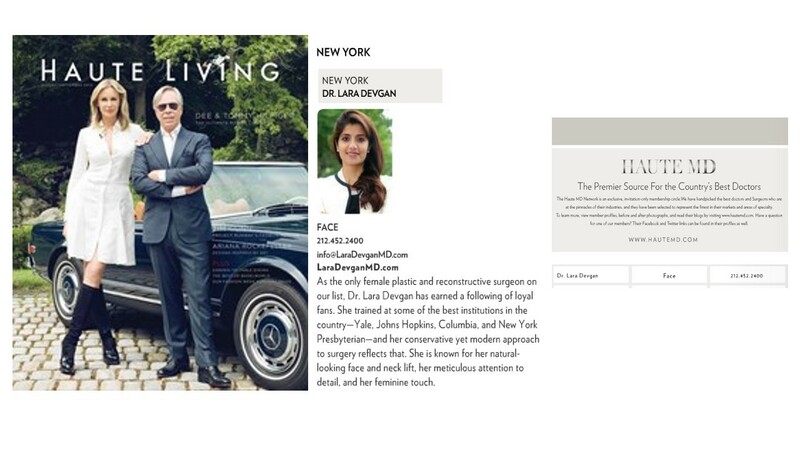 If you have been thinking about breast enlargement or breast implants, please feel free to email my office at info@LaraDevganMD.com or call (212) 452-2400 to arrange a consultation. My New York City practice accomodates out of town and international patients who fly in for surgery, as well as those who are local to Manhattan. Read Dr. Devgan's article entitled "The Secret to Beautiful, Natural Breast Augmentation," which was an invited editorial for Healio.com, a national online journal for physicians. Read Dr. Devgan's article entitled "Which Breast Implants are Best for You?" which was an invited editorial for Healio.com, a national online journal for physicians. "I DID THE BIG REVEAL... AND I LOVE THEM!!" "I CAN HONESTLY SAY IT WAS WORTH IT"
"I CAN'T BELIEVE I LOOKED LIKE THAT BEFORE"